The European Union Advisory Mission Ukraine met with the Ministry of Internal Affairs to discuss the implementation of the Sambir Police project. The joint project of the EUAM and the Police of Lviv introduced new forms and methods of work at Sambir Police Station in Lviv region in June this year with the aim to implement an effective Response Police. During the discussion, the Deputy Head of Mission, Hugues Fantou, emphasized that the main goal of EUAM is to ensure compatibility of efforts for effective civilian security sector reform. “The way the reform goes should be determined by Ukraine, and we are here to assist them,” said Hugues Fantou. 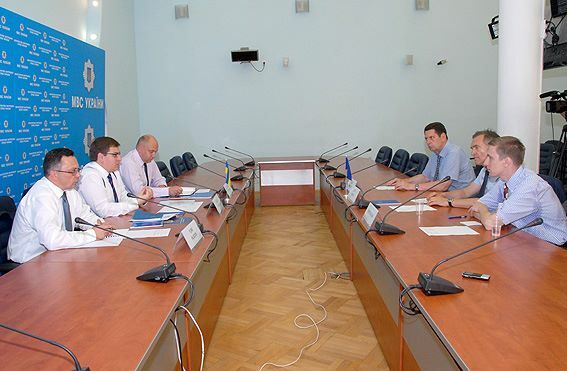 The meeting was attended by the Deputy Minister of MoIA, Oleksiy Takhtai, the Deputy Head of EUAM, Hugues Fantou, the Head of EUAM Outreach Udo Moeller, the Chief of Staff of Lviv regional police, Yuriy Hladun, and the Deputy Chief of Staff of Lviv regional police, Serhiy Gryvnyak.